One thing I love about cooking is that I can prepare the recipes I love. Another is that I can prepare for my friends the recipes that they love. I researched this recipe long and hard, trying to reproduce memories of France for a good friend. The recipe is quick and simple, and it uses ingredients easily found in most grocery stores. Hope you have a chance to give it a try. Enjoy! - Break the eggs in a bowl, and add the sugar, the rum or vanilla, the lemon peel, and the pinch of salt. Mix everything until uniform. Add the condensed and the evaporated milk. Use a mixer to ensure the composition is homogeneous. - Note that the French flan needs to be between three and four fingers tall when cooked. Choose a baking pan where the composition would fill about that much space. Also, make sure that there is a bit of extra space on top - the flan tends to bloat while cooking, and then it reverts pretty much to its original volume. - Preheat the oven to 425F. - Carefully lay the pie crust such that it uniformly covers the baking pan (both bottom and sides). Add the flan batter. Leave about half an inch of crust above the batter level, and discard the rest. - Bake for 50 minutes. Remove from heat and allow to cool. Serve cold. 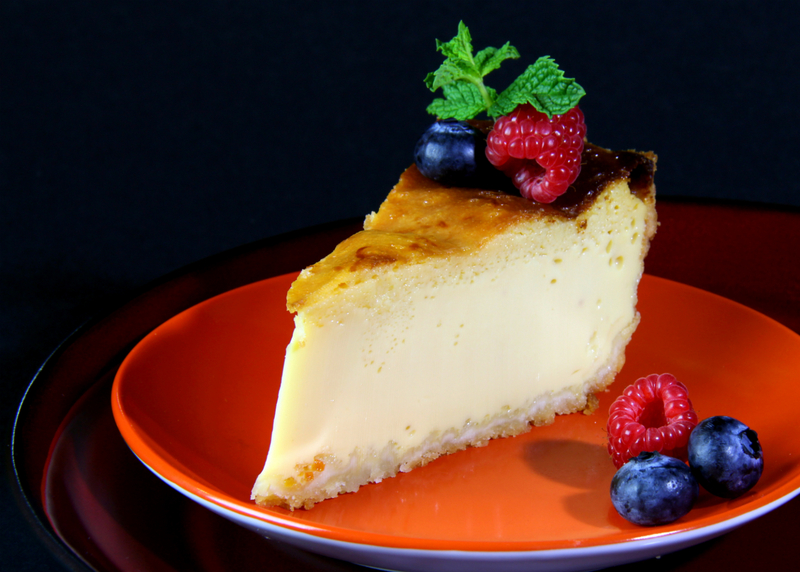 - Carefully slice the flan, making sure you don't crumble the crust. - For presentation, I topped the flan with a few fresh berries. I also placed the dish on an orange plate - I believe this color nicely matches the colors of the flan. - It's a French recipe, so you might as well serve it alongside a glass of champagne.